Controlling-leaders end up with compliant teams. Most leaders have control issues. On a scale of 1 to 10, how controlling are you? Just go with your gut. Suppose you’re an 8 on the controlling-leader-scale. If you have a team of 5’s, expect compliance from them. Correct quickly, rather than making space to learn. Puppet-master. Everything has to be done their way. Tweak. Controlling-leaders devalue other’s ideas by adding small improvements. You steal ownership when you tweak another’s ideas. Expect compliance. Don’t expect people to step up when you hired them to take orders. Don’t trust. The only person controlling-leaders trust is themselves. Save the day. When things go wrong, controlling-leaders ride in on big white horses. If you save the day, no one else has to. Delegate tasks – cling to authority. Perhaps the toughest part of delegating is giving the authority to complete assignments without your intervention. Controlling-leaders are big dogs. Compliance is self-preservation. Declare your intentions in positive terms. Don’t say, “I want to be less controlling.” Describe who you aspire to become, not how you want to be less of something. Ask questions that begin with ‘what’ or ‘how’, not ‘don’t you think’, ‘wouldn’t you’, or ‘why don’t you’. Tolerate silence after asking questions. 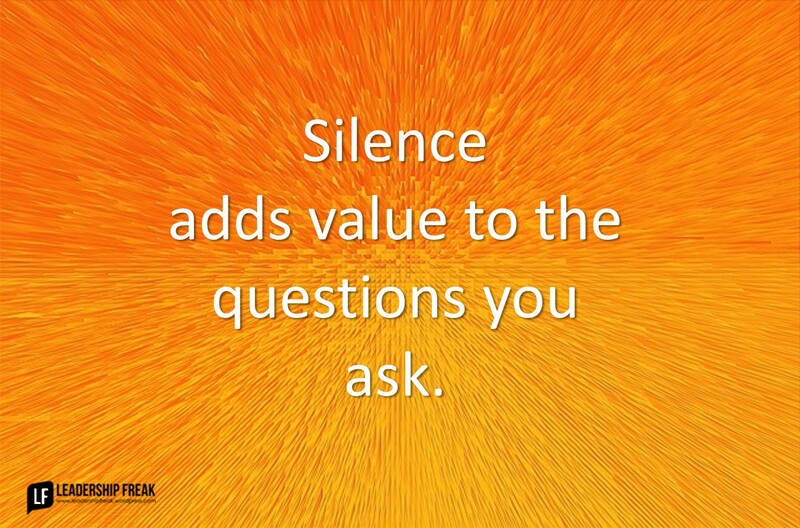 Silence adds value to the questions you ask. Go nuts when compliant dogs bark. The way you interact with others. The more successful you become, the more necessary it is to build relationships and create environments where others take on new challenges. How might leaders control less and enable more? I really enjoyed this, Dan. Thank you. I would like to learn from this but don’t understand what “Go nuts when compliant dogs bark” means. Cheer like crazy. 🙂 Glad you asked. Intent is critical in becoming more enabling but it can go much farther than who you aspire to become. Leaders who effectively communicate intent are able to describe the desired outcome or end state. That is a liberating thing for a subordinate because he/she knows where the organization should be going. Leaders can refine intent over time by engaging in dialogue or spot checks to ensure things are on track. An even more enabling use for this dialogue is to provide subordinates with the opportunity to ask questions, identify areas of concern, and present interim analysis that helps refine the problem. Leaders can also enable teams by setting priorities and sticking to them. Leaders at different levels or with differing responsibilities set priorities on different time horizons and dialogue between leaders is critical to allow them to nest priorities in mutually supporting ways. Warning: it is easy to say something is a priority. The real test of priorities is which of them get resourced. Common resources include time, people and money. Less common is approaching the number of tasks a leader and his/her team must accomplish. If something is really important and leaders want a team to really focus on an issue, the leader may have to look at all the tasks a team/subordinate leader must accomplish and determine what is really important to do now, what can wait until later and what can get reassigned or dropped. Dan, chime in if I don’t get your meaning on this one. I understand Dan’s point to mean that if we are always adding to everyone’s ideas, they may get the idea that their own ideas are never good enough. At times, adding our own insight and experience is good and needed. But if we do that all the time, it can actually become draining on others and they will just start coming to us for the ideas. That runs opposite to good delegation. Good leaders realize that there are many roads to success, and our team will not always do things the way we believe it should be done. But they can still be successful, and most importantly gain experiences that we take away when we completely control the course (see the first two bullets under point #1). I have a question. I didn’t quite get what um meant by “You steal ownership when you tweak another’s ideas”. English is not my native language. How do you improve someone elses ideas? How do you guide and lead if you cannot comment on other thoughts? So it is a matter of perception, right? Somewhat like when helping stop being helpful because too much is too much. I completely agree that adding little “improvements” to an idea will take the wind out of the idea bringer’s sails. I’ve had many ideas manipulated to the point that I just stopped bringing them. Be sure that if you do suggest an addition to the plan that it’s really needed, not just something that you’re adding to put your stamp on it or something that is actually included in the plan and you didn’t notice it when you read through the notes. Nothing is more telling than a manager who says “this should have digital included” when it’s one of the data points listed on the page. Hi Jay and Marcio. I like to put it this way. Their idea is better than your idea, even if it isn’t quite as ‘good’ because they own it. Good people with run with their ideas and improve them as they go. It’s an issue if you see painful failure ahead and don’t say anything about it. But, offering small improvements can drain energy from people. Team meetings where ideas are being developed are good places to improve ideas. But leaders should be careful not to dominate these conversations. Your ideas and insights are praiseworthy. It covers almost every aspect of controlling leaders. They suppress ideas and curiosity. And hence they create blind followers. The reasons could be many, but one reason is dominant one- They are fearful. They do not want to be exposed. And hence controlling becomes their tools to show their knowledge. They can be enabling leaders the moment they start accepting and listening to others. Such leaders create leadership vacuum. And they come forward to show that they are only capable. Such leaders flourish where systems and processes are weak or missing. Thanks Dr. Gupta. Controlling leaders enjoy blind followers. 🙂 Nicely said. They don’t like being challenged or questioned. A controlling-leader doesn’t like having their ideas improved upon by others. You use of “blind follower” got me thinking. Don’t lead/manage by creating a culture driven by intimidation and fear. I’m a little conflicted and it started with the initial self rating so maybe there’s another term or designation that I’ve missed. I want to be “controlling” but not in a dictatorship role. I want to be “in control” but still delegate, develop and encourage my team. Someone has to be in charge and in control – but the variety of positive techniques we have learned in leadership to work with others will balance this control and avoid the negative connection. What’s a better term for “controlling-leader” that is positive? sgtblewis2, it might help to think of these labels in terms of how we think of ourselves. I believe a leader who is in control, but is not “controlling” in the context of Dan’s column is a true leader. Those around you will recognize it and your team will appreciate it. Word will spread, and your team will the one everyone wants to join. The greatest gain I had came from delegating tasks, with the authority to complete them, while maintaining the responsibility for their proper completion myself. Your people are unlikely to complete every task (a) as well as you would or (b) the way you would. Allowing them to make mistakes (without risking safety) will give them confidence and help them grow. Taking responsibility yourself for their mistakes will keep them from getting gun-shy so they take full advantage of every opportunity to grow. I’m wondering if you could elaborate on “Go nuts when compliant dogs bark.” on the “How to be less controlling and more enabling” list? It seems to contradict 1, 2, & 5. Thanks Daniel. I’m glad you asked. I use the expression “go nuts” in a positive. Go nuts with praise. Applaud quiet people when they speak up. Cheer when someone finds the courage to offer constructive dissent. Hope that helps.